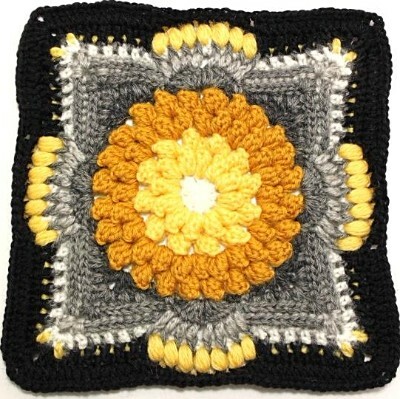 This pattern is a part of the Garden of Dreams CAL project. 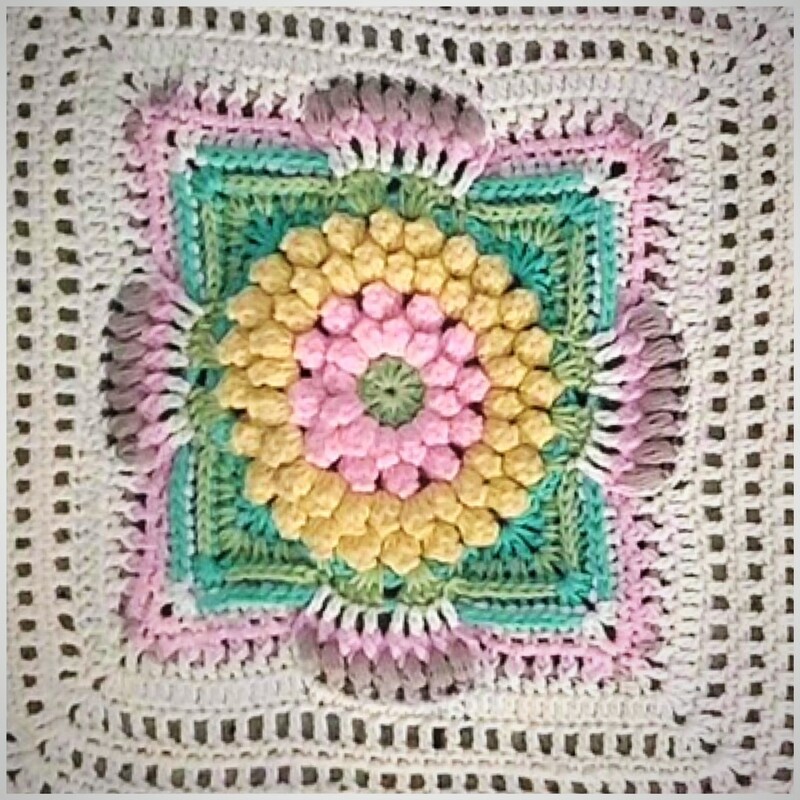 You need 7 different colors of yarn for this flower square.You can crochet this square using almost any kind of yarn, but I recommend yarns with a hook recommendation of max 4.5 mm. COPYRIGHT - This publication is protected by the Copyright Act. It is available to you free of charge. You must not modify or distribute the pattern. 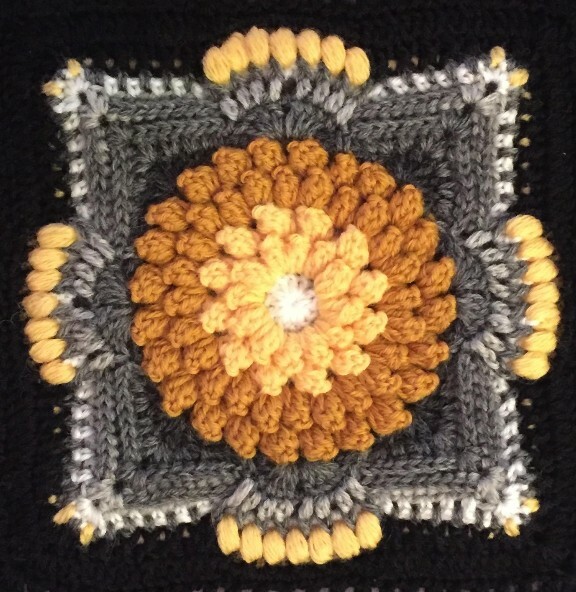 Reselling the free pattern in all forms (a whole set of instructions or a single part) is prohibited. 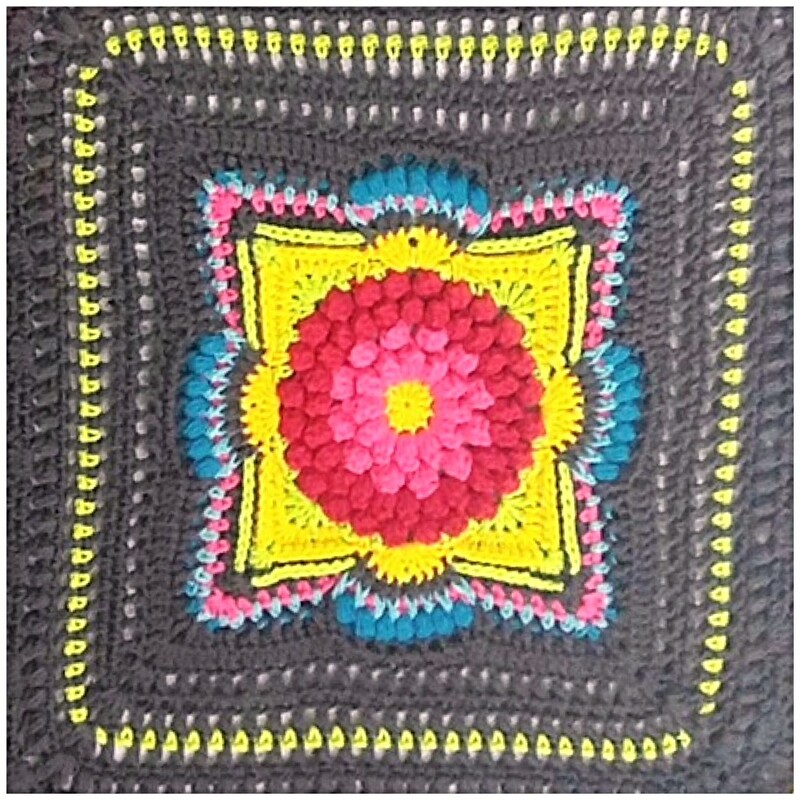 Selling a finished product is prohibited unless otherwise agreed with the designer. 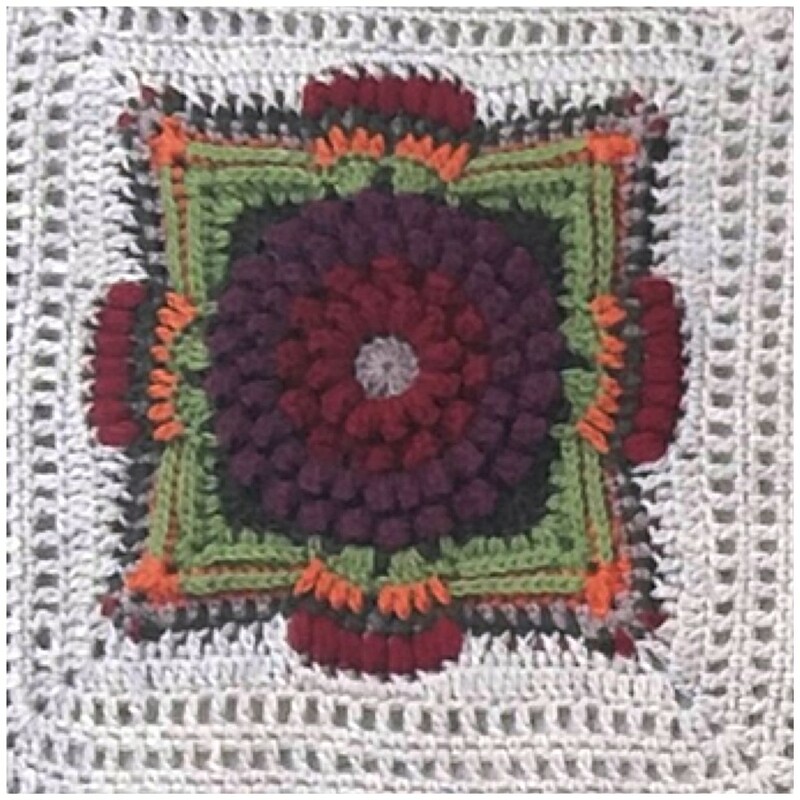 To download pattern for private use: http://www.anceliga.fi. Sharing the pattern is not allowed. © 2019 Anne Vierimaa / Anceliga Design, All rights reserved. 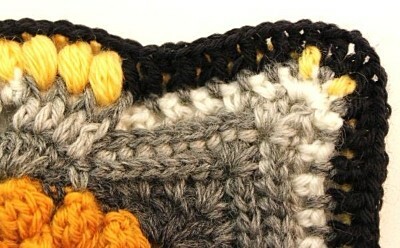 **See stitch instructions from the separate Stitch Tutorial file. 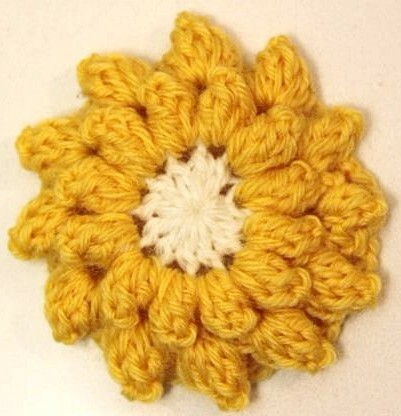 Make a magic ring and crochet rnd 1 sts into it. Ch 3 (count as dc), 11 dc into the ring. 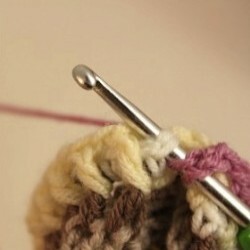 Join to the 3rd ch with sl st. Cut yarn and fasten off. (Ch1, pc) 11 times, ch1. Join to the 1stpc with sl st.
Sl-st into the next ch1-sp. 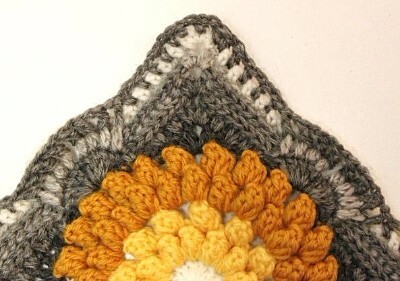 (Ch 3 (count as dc) 4 dc into same ch1-sp) crochet as 1stPC in rnd 2. (Ch2, sk pc, pc into ch1-sp)11 times, ch2, sk pc. 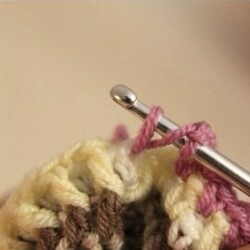 Join to the 1stpc with sl st. Cut yarn and fasten off. (SSdc into any pc, 4 dc into same st) crochet previous sts as pc. In this roundevery other pcs are made into pc and every other into ch2-sp. (Ch1, pc into ch2-sp, ch1, pc into pc) 11 times, ch 1, pc into ch2-sp, ch1. Join to the 1stpc with sl st.
Sl st in the next ch1-sp. 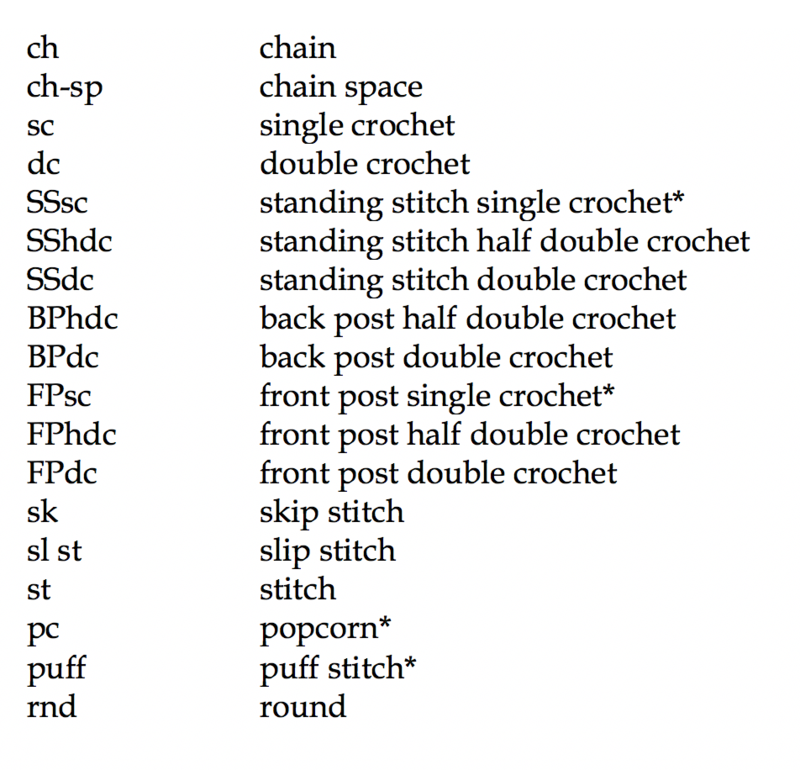 (Ch 3 (count as dc) 4 dc into same ch-sp) crochet previous sts as pc. (Ch1, sk pc, pc into ch1-sp) 23 times, ch1. Join to the 1stpc with sl st. Cut yarn and fasten off. SSsc into any ch1-sp, *sk pc, ((dc, ch1) 5 times, dc) into same ch1-sp. (Sk pc, sc into ch1-sp, ch 3) 4 times, sk pc, sc into ch1-sp. * 4 times, omit the last sc at the last repeat. Join to the 1stsc with sl st. Cut yarn and fasten off. Your first sc will be a SSsc, *sc together through the last ch3-sp of the previous rnd and the top of pc of rnd 5 (photo). Sk sc, 2 dc into dc, (2 dc into ch1-sp, sk dc) 2 times. (2 dc, ch2, 2 dc) into central ch1-sp. (Sk dc, 2 dc into ch1-sp) 2 times. 2 dc into dc. Sk sc, sc together through the ch3-sp and the top of the pc of rnd 5. Sk sc (rnd 6) and pc (rnd 5). The next 4 dc group are worked into ch1-sp of rnd 5 and through the next ch3-sp of rnd 6. The second 4 dc group are worked into the same ch1-sp but into the next ch3-sp o f rnd 6. (4 dc, ch1, sk sc (rnd 6), 4 dc) into same ch1-sp (rnd 5). Sk pc (rnd 5) and sc (rnd 6) *4 times. Join to the 1stsc with sl st.
Make a sl st into next dc, *ch 2 (count as BPdc in next repeats) BPdc in the next 7 sts, (2 dc, ch 2, 2 dc) into ch2-sp. BPdc in the next 8 sts, ch2, sk (sc and 4 dc), sc into ch1-sp, ch2, sk (4 dc and sc)* 4 times. 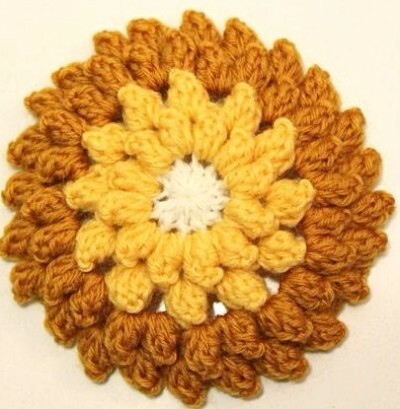 Join to the 2ndch with sl st. Cut yarn and fasten off. *SSBPhdc into dc after corner ch2-sp (count as BPhdc in next repeats), BPhdc in the next 9 sts, working on rnd 7 (in front of ch2-sps of rnd 8), (dc, ch1) in the next 7 sts, dc into next st.
BPhdc in the next 10 sts, (2 hdc, ch2, 2 hdc) into ch2-sp. * 4 times. Join to the 1stBPhdc with sl st. Cut yarn and fasten off. *SSsc into corner ch2-sp (count as sc in next repeats), 4 more sc into same ch2-sp. (Ch1, sk 1 st, sc in the next st) 6 times. (Sk dc, 2 sc into next ch1-sp) 7 times, sk dc, sc into next st, (ch1, sk 1 st, sc in the next st) 5 times, ch1, sk 1 st* 4 times. Join to the 1stsc with sl st. Cut yarn and fasten off. *(SShdc into 1st sc in corner (count as hdc in next repeats), ch1, sk sc) 2 times, hdc in sc. (Hdc into ch1-sp, ch1, sk sc) 4 times, hdc into ch1-sp, sk (sc, ch1-sp, sc). sk (sc, ch1-sp, sc) of round 10, hdc into ch1-sp, (ch1, sk sc, hdc into the ch1-sp) 4 times. * 4 times. Join to the 1sthdc with sl st. Cut yarn and fasten off. Working in front of ch1-sps, make the 1stst into 2ndsc at the corner of (rnd 10) after 1sthdc of rnd 11. (Puff st into 2ndsc of 2sc-group of round 10, ch 1, sk FPdc of round 11) 6 times. Puff into 2ndsc of 2sc-group of round 10, ch2, sk (FPdc, hdc). Sc into ch1-sp of round 11, (ch1, sk hdc, sc into ch1-sp) 3 times, ch1, sk hdc, sc into hdc, ch1. * 4 times. Join to the 1stdc with sl st. Cut yarn and fasten off. Working in front of ch-sps from rnd 12. Work 1stst into middle hdc at the corner of the previous round corner. (Photo). (FPdc into hdc of round 11, FPhdc into sc of round 12) repeat 5 times, sk hdc (rnd 11), 2 FPhdc into same dc of round 12. * 4 times. Join to the 1stFPdc with sl st.
Make a sl st into ch2-sp at the corner. *(Ch3 (count as dc in next repeats), dc, ch2, 2 dc) into same ch2-sp. Dc in the next 14 sts, sk FPsc, 2 hdc into ch1-sp, (sk FPsc, 2 sc into ch1-sp) 4 times, sk sc, 2 hdc into ch1-sp, sk FPsc, dc in the next 14 sts* 4 times. 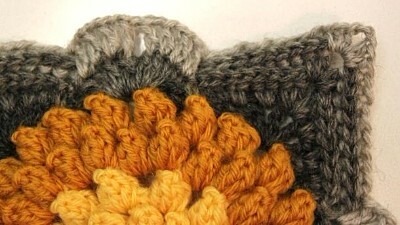 Join to the 1stdc with sl st.
Cut yarn and fasten off or continue with The Garden Paths section. Fasten off and secure ends, block the square, wet and let dry. Well done! Your Dahlia flower square is now blooming nicely.